Long Live the 70's and 80's! My youngest sister emailed me and said, "Send more old pictures so I can laugh my fanny off at you guys!" So, here are some more, but none with her in them just yet . . . savin' the best for last laughs! The top picture is taken on my Grandma and Grandad's front porch and is one of my all time favorite pictures, especially of my middle sister, Angie. She is on the top row in the middle (is that not the cutest face?!) 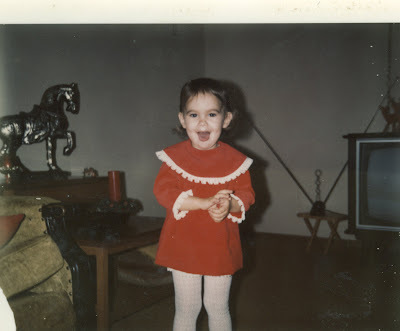 I remember that outfit for some reason, it was terry-cloth. 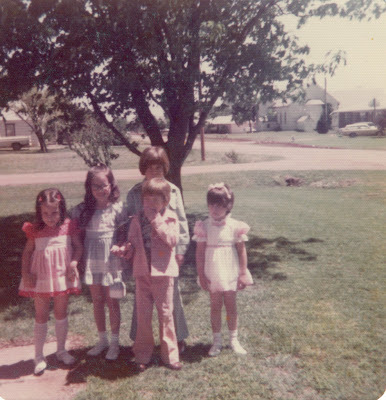 My cousin D'Ann is to her right and to her left is my Grandma and Grandad's neighbor (who happened to be one of Angie's best friends, and her mom was my piano teacher), Lori B. 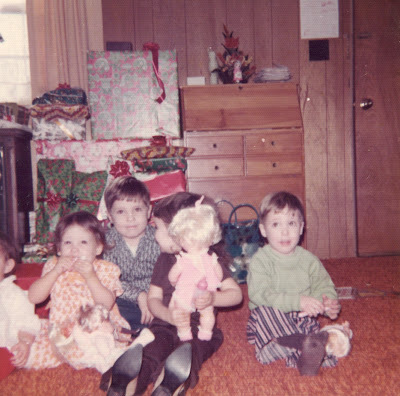 On the bottom is me, then my cousin Brent, then Mark. 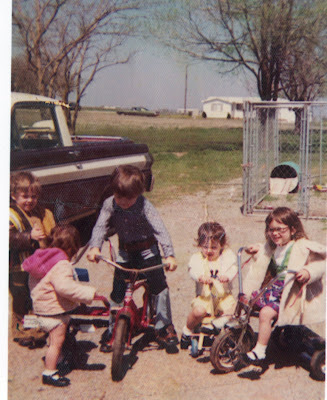 I had the most fun with my cousins back then and still do to this day. The bottom picture was taken at my other Grandparent's house at Christmas. I am totally diggin the furniture in this picture! The TV with the rabbit ears, the foiled horse statue, the green velvet chair with the nail-head trim talk about some style. I think that this picture of me looks a little bit like Carlie, what do you think? I'm probably about 2 in this picture. Enjoy! Hope Amber has stopped laughing by now! Just wait sister dear! I have some pretty sweet pictures of you! And I don't mean sweet in a good way. 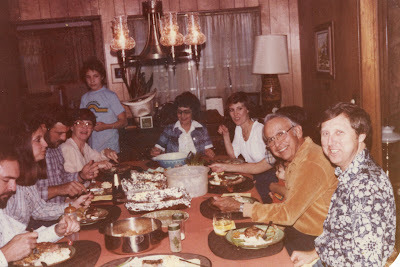 I have some great family pictures of Christmas, Thanksgiving, and Easter from the 70s and 80s. It's almost as much fun looking at the people as it is looking at the furniture, cars, and clothes! The top picture is from a time in the summer when my Aunt Patty and Uncle Jerry came in from California to my Grandma and Grandad's house in Piedmont. 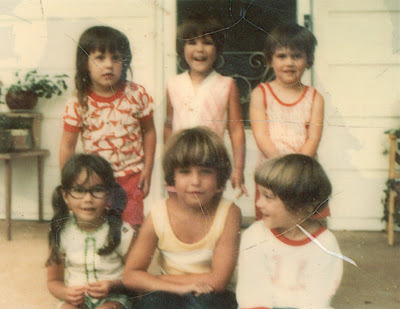 The middle one is of my three cousins and myself (and part of my sister - I didn't take the picture, so you can't be mad at me). I love my big, giant cowboy boots and my cousin Mark's pants in this picture. Oh! and don't forget the orange shag carpet and wood paneling! 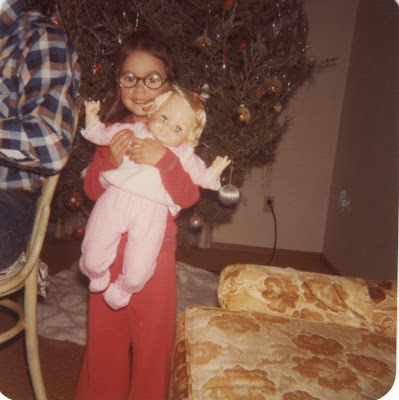 AND, if I remember correctly my outfit was purple polyester. 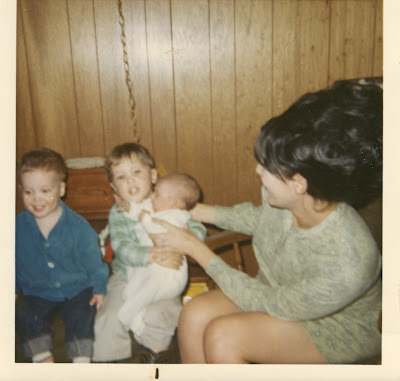 The bottom picture is my two cousins Rusty, and Robin, and myself at my other Grandma and Grandpa's house. Check out the cool stereo/record player thing against the wall. 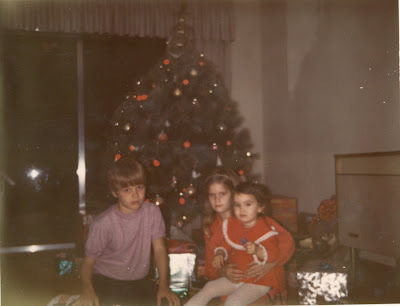 Not sure why we aren't smiling, I know we were happy children. Maybe it was because we hadn't opened the presents yet? There are more pictures to share, but I didn't want to scare you all at once! Enjoy the little blast from the past! I Smell . . . er . . . TROUBLE! Conner and Nicci never played with the toilet paper. Ethan and Carlie did and do (do). I don't know if it's trouble I smell, but it sure is something. I'll let you know when I figure it out. Way to Go God and E*PN! This Christmas Will You . . .
Buy more than you did last year? Now, I know I just posted about blogs to shop from and here I am encouraging you to refocus your spending elsewhere. Either way (shopping from the places I mentioned or watching this video and choosing differently) you are helping a person in need. I'm not sure what our family will do. My hubbie and I have been talking about this for a while now. We gotta sit down and plan - we'll let you know what we come up with. As the list goes on he names more specific things, but he wanted to be sure and let Santa know that he wanted ALL of the toys. He is too smart. Why didn't I think of this when I was a kid? A Verse That Speaks to Me Today . . .
Hope, it is found when I need it most . . . enjoy the day! In my zest for Adoption Awareness Month I hear that the CCAA mailed referrals for two days of LIDs this month. Just two days. That is a very small amount. The CCAA remains steadfast that domestic adoption is on the rise and that abandonments are down. I am grateful for that, but is that really true? Pictures I see of inside orphanages show quite a few children. Why are these children still in orphanages if there are families lined up from 2006-2008 to welcome them? Obviously, I do not have all the facts, I do not work for the CCAA, nor do I work in an orphanage, nor do I live in China. I just know what I see and hear from friends who have been over there. So, we wait . . . It's a cold, rainy Monday here in Tulsa. I love days like this, where I am nice and cozy warm, the smell of clean laundry wafting through the house. What's it like where Avery is? I love Oklahoma. I get all the seasons in full force with all their beautiful and ugly colors. I get mountains, I get plains, plateaus, rivers, lakes, big city life, and small town glory. The people here are usually pretty friendly and most of us have a heart for Jesus. Amazing Grace How Sweet the Sound . . . The bottom picture is of the Wudang Mountains in China. There are so many very unique sites in China. 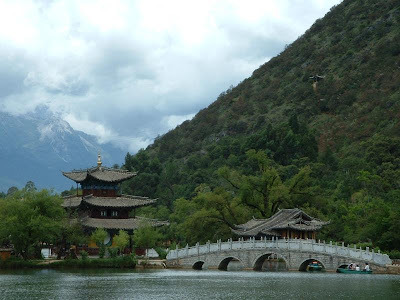 Of course, there's the Great Wall, there's the Dragon Back Mountains, rice paddies, lakes, palaces, remote farm communities, very different ways of dressing, worshipping, relating, being, and living. 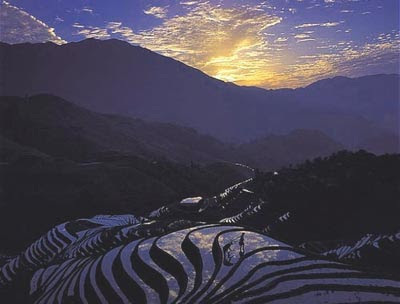 The middle picture is a rice farm terraced on the mountains, and the top is Kunming, Jade Snow Dragon Mountain. So . . . You Got Some Shopping to Do? Well, as you know Christmas is coming very soon. We all have a little shopping to do, right? Well, why not shop online? The benefits to shopping online? No crowds, no parking hassles, no strollers to mess with, no pushy sales people, and no cold malls which encourage you to buy a sweater for yourself while you are there! Why shop at one of these or the ones listed to the right? Because they all help orphans that's why! See, you CAN help orphans just sitting in your own home! Isn't that easy? The one link that is "Touching Lives" has lists of blogs and sites totally helping orphans, that is the sites whole purpose. I have purchased a shirt for myself from "Lucky Bug Kids Clothing." She is super nice and aims to please - good quality stuff. Adopting a child is a labor of love, it's being what they call "paper pregnant," it's paperwork gathering/notarizing/copying/requesting, it's waiting, it's waiting some more, it's praying, it's being part of a puzzle bigger than you can imagine, it's happy, it's sad, it's remarkable, and it's what we are supposed to do. These pictures have been on here before a while back, but I just had to go through them again looking for something. I was reminded of just how far we have come, how much paperwork is involved, and it reminded me of what we are still doing. We are "paper pregnant" with Avery and I wouldn't have it any other way. Orphan Care International was created by our adoption agency, Dillon International. It helps to provide medical care, healthy meals, educational services, foster care training, surgeries, and more to orphans who are still waiting for their forever families. This is a wonderful organization to support if you feel lead to give. 36He took a little child and had him stand among them. Taking him in his arms, he said to them, 37"Whoever welcomes one of these little children in my name welcomes me; and whoever welcomes me does not welcome me but the one who sent me." A Poll - Help Us! Our children all have "nicknames" except Conner - he refused. Nicole is called Nicci or Zoe. Zoe is because when she was little she used to were bracelets on both hands and had reddish hair, that reminded us of the monster Zoe on Sesame Street. Ethan is Diggy, after Diggy on the show "Run's House." Their son Diggy has a scratchy voice and our Ethan does, too. Now, here is where we are having a hard time. Carlie's nickname is a debate. My husband wants to call her Pepper Pots. I want to call her Tinkerbell (when she has a poopy diaper she can be called Stinkerbell or just Stink). So, if you could please vote in our poll (to the right) as to what nickname you think Carlie needs that would be great. I'll post a picture of her so you can see the deserving young child is . . . . When Love Takes You In . . .
Ephesians 1:3-6 Praise be to the God and Father of our Lord Jesus Christ, who has blessed us in the heavenly realms with every spiritual blessing in Christ. For he chose us in him before the creation of the world to be holy and blameless in his sight. In love he predestined us to be adopted as his sons through Jesus Christ, in accordance with his pleasure and will— to the praise of his glorious grace, which he has freely given us in the One he loves. As you can see, we are all adopted by our Heavenly Father. November is Adoption Awareness Month. PLEASE watch this short video. Even if you are not called to adopt, you can still do something: sponsor an orphan, volunteer with your local crisis pregnancy center, and last but definitely not least pray. Pray for the orphans, pray for the families in the process of adopting, pray for foster families, pray for countries who seem to be a little too proud or greedy. All this month this blog will feature different ways you can help orphans. Trick or Treat Smell My Feet . . .
A night in the neighborhood . . . . This was our first year to not have all of them with us. Conner had to be at a birthday party at 7, he was a "Zombie Lawyer." So, by the time we got back to our neighborhood it was really dark and we hadn't hit a single house yet! We got busy! Clothing Issues Again . . .
Ethan wanted to be a shark first - couldn't find one. So, I took him to the Disney store and told him that he could have whatever costume he wanted (safe costumes there, not too gorey, or evil, and they were %50 off!) we came out with a Mickey Mouse costume for Ethan, and a Minnie Mouse costume for Carlie. Won't that be so cute mom thinks!? I just had to get a long sleeved black shirt and some black tights (I'm thinking as I'm buying the tights that he will definitely not be happy about the tights, but I want the costume to be PERFECT) to go under the Mickey costume and we were set. So, Halloween night rolls around and we are getting dressed. He had on a blue and green soccer type shorts outfit that he wore to preschool and he was stressing that he couldn't put the Mickey costume on OVER the soccer shorts ensemble - we hadn't even attempted the tights and long sleeved black shirt yet. Somehow I talked him into the long-sleeved shirt, tights, and Mickey costume. He had it on for about 10 minutes and just couldn't stand it, and I tried everything to distract him, but it was not happening. He finally stripped and put the blue and green outfit back on stating, "I am NOT going trick-or-treating! I am NOT going to get candy!" Jeesh. In the meantime the other kids are all getting their costumes on, I'm doing Carlie's bow for her mouse ears, and then Nicci's hair, Conner's in the bathroom putting on his face paint (don't call it make-up because he's not a girl) and Ethan is watching. He gets the tights back on (the LAST thing I EVER expected him to wear! ), then the Mickey Mouse costume went on over the black tights and the blue and green soccer shirt. He put on the ears and the black shoes and he was set. Hey, I can live with this! He went willingly and it was his idea! He'll outgrow this phase. I'm not worried. We do our best to handle it with as much patience, guidance, and humor as we can, all the while making him think that he's in control. When we got home he IMMEDIATELY stripped and put on the blue and green soccer clothes. Our third child, Ethan (also known as Diggy), has "issues" with clothing. Ever since we told him we were going to the beach this past June he has worn a bathing suit - I didn't tell him we were going until about mid-May because he would obsess about it. Now, I don't totally let him have control over what he wears. There are two rules/guidelines/boundaries that he has: no bathings suits at preschool, and no bathings suits at church. He knows these rules very well, not that he doesn't try to get away with wearing a "ba soup" to the forbidden places. Everywhere else is fair game - the zoo, the grocery store, outside with/without water, the mall. Bathings suits make good pajamas it turns out! Some days he does try to make the rules work for him, he'll even try changing to a different bathing suit thinking that "maybe it's this particular bathing suit my mom doesn't like?" And when he comes home from a long day at preschool or church he strips as fast as he can into a bathing suit. I'm not sure what the winter will hold for us as far as clothing choices. I've been trying to transfer this obsession to those slicky basketball pants, but so far it's a no go. He's such a cutie, the little stinker!